I’m not a huge fan of British movies, unless they are comedies.Â That’s probably somewhat jingoistic to actually come out and say, but it is regrettably true.Â I loved Chariots Of Fire and everything that Monty Python ever did, but the same is true for near everyone who has ever owned a VCR.Â But now there’s another British movie which I have come to enjoy and it’s ready for you in a version made to celebrate what it has accomplished. Starting this May 5th, now available on DVD from BBC Films and Miramax Home Entertainment comes the classic tale of paradise and finding it in the midst of life.Â Enchanted April â€“ Miramax Award-Winning Collection is ready to saunter out of your television screen and fill your living room with warm and funny tales of life and what it’s really all about.Â Bring home this award-winning classic film today! Four British women, barely connected in any social manner, are struggling through their lives and what marriages the few of them have left.Â Mrs Arbuthnot and Mrs Wilkins meet while both looking for a place down in Italy to take a little vacation to escape from their collapsing lives.Â To help defray the costs, they also bring along Mrs Fisher and Lady Caroline Dester.Â It seems as though none of them have anything in common besides their problems, so they bond through their personal struggles.Â Eventually, these four women, alone in a coastal Italian castle, learn anew what the point of life and love is, even when nothing is going as you planned it.Â This movie stars Miranda Richardson, Josie Lawrence, Polly Walker, Joan Plowright, Alfred Molina, Michael Kitchen and Jim Broadbent. The special feature included in this DVD is an optional audio commentary on the film from director Mike Newell and producer Ann Scott. I’m not sure, but I might have watched part of this movie earlier.Â It was back when I used to get BBC America, one of the greatest television channels of all time.Â It didn’t make an impression on me then and this certainly isn’t the type of movie I would choose to watch on my own.Â So I decided to try hard to see this movie through a general lens, instead of simply focusing on what I myself might like.Â I had wondered why Miramax would choose to include this film so early in their award-winning collection, but the depth and subtlety of this story impressed me greatly.Â It’s very easy to see why this movie won awards and it most likely deserved to win more than it did.Â It is a very telling and movie story about the core of life and the message is that it’s never too late to find that heart again.Â It’s an important message and a fantastic movie. April might have passed, but don’t let your chance to own this film do the same. 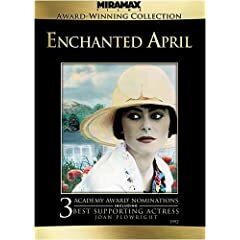 No user commented in " Movie Review: Enchanted April â€“ Miramax Award-Winning Collection "